The numbering system described above applies exactly only if the bronchi and the arteries are precisely parallel, an uncommon scenario. If segments are supplied by arteries that do not directly parallel the bronchi, each artery derives its name from the bronchial segment it supplies. So, for example, a right middle lobe artery may bifurcate into an artery that supplies only a portion of the lateral segment, B4, and a second artery that supplies the remainder of the lateral segment and the medial segment, B5. In this case, the first artery is called A4a, and the second artery is called A5+4b. The two major branches of a numbered artery are called a and b, for example, A3a and A3b. the right main bronchus. This most commonly divides into an anterior segmental branch (Fig. 1D) and an upper branch. The upper branch usually divides into apical and posterior segmental branches (Fig. 1C). However, there is commonly a branch from the interlobar pulmonary artery to the posterior segment of the upper lobe and sometimes a branch to the apical segment. 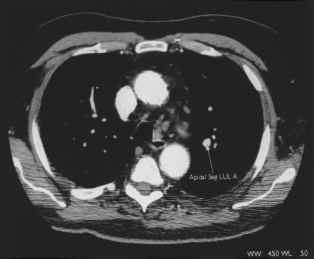 Approximately half of the time, two right middle lobe arteries arise from a common trunk from the right interlobar pulmonary artery, and about half of the time they arise as two separate branches of the interlobar artery (Figs. 1G and 1H). A branch of the medial segmental artery most frequently supplies the anterior aspect of the lateral segment. Figure 1 Examples are taken from two different patients. (A) Apical segmental artery, LUL. Unlike the common apicoposterior segmental bronchus, this artery frequently has an origin separate from the posterior segmental artery. Below the origin of the right middle lobe artery or arteries, the interlobar artery becomes the right lower lobe artery. It usually then gives off one or occasionally two posteriorly directed arteries to the superior segment of the right lower lobe (Fig. 1G). 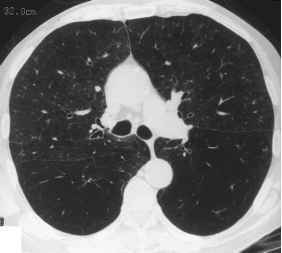 This is usually at the same level as, or slightly caudal to, the takeoff of the right middle lobe bronchus. The name of the artery beyond the origin of the superior segmental artery is the pars basalis or basal artery or trunk (Fig. 1H), and this gives off the basal segmental arteries. In slightly more than half of cases, the medial basal segmental artery arises first or arises first as a common trunk with the anterior segmental artery— this representing a very variable artery (Fig. 1J). Finally, the lateral basal and posterior basal arteries arise independently or bifurcate from a common trunk, again with significant variability (Fig. 1K).